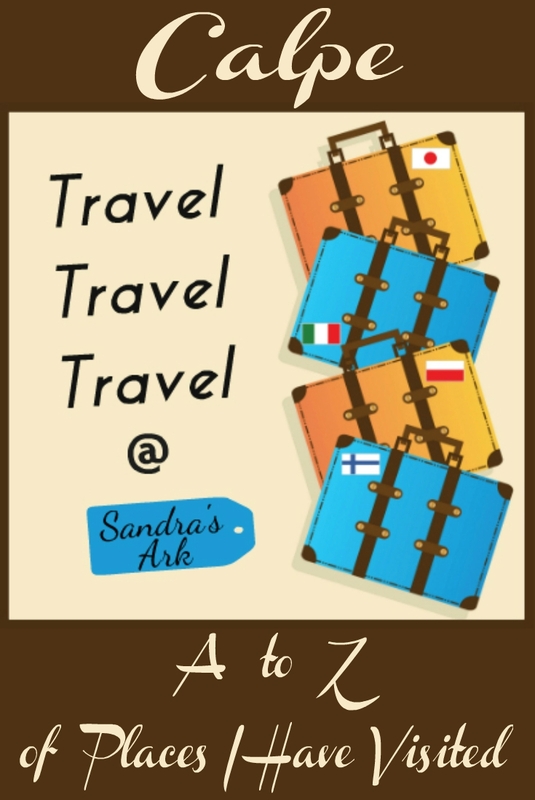 I have started writing about some places I have visited and posting them in alphabetical order. Still wondering what I will do for the more unusual letters like Q etc. but I think I have an idea for Z. 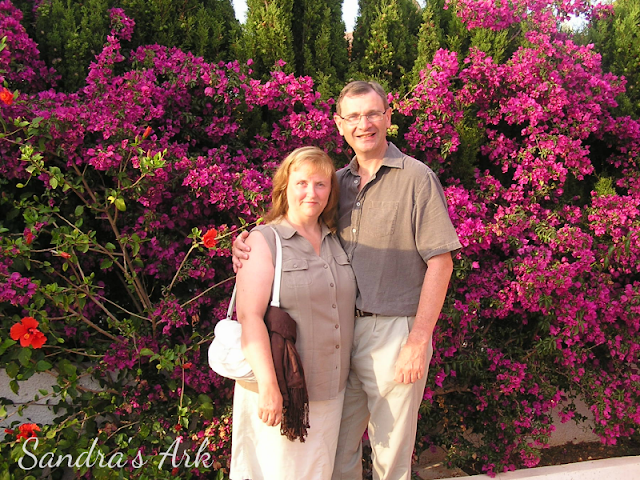 We have been to the same villa in Calpe 3 times and love both the villa and the town of Calpe. We found it by chance on the internet and discovered that it is owned by a guy from Liverpool who is married to a Spanish girl and lives in the next small town to Calpe. After we had already been there we invited my sister and her husband to come for a week with us to celebrate my birthday and their wedding anniversary (I mentioned the fact that she got married on my 13th birthday in the first post in this series on Alicante). 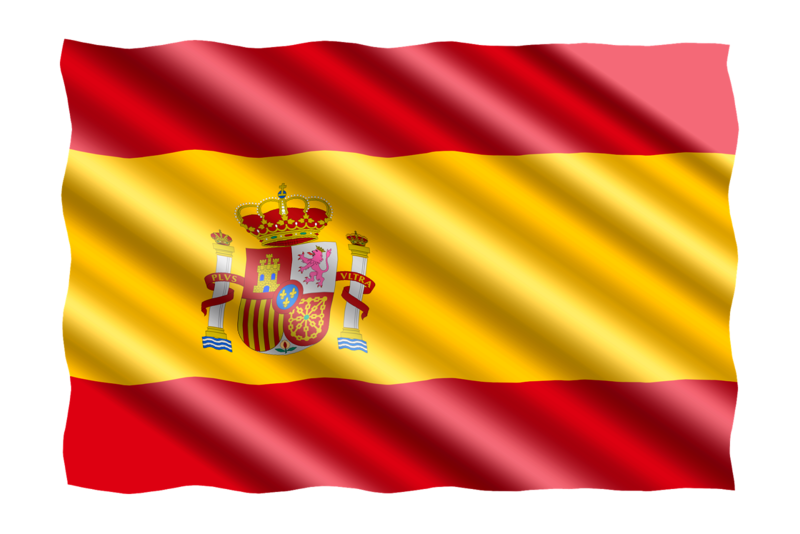 Calpe is found on the South East coast of Spain about an hour's drive north from Alicante airport. The drive north along the coast is beautiful on a sunny day - and we have only seen it in the sun. 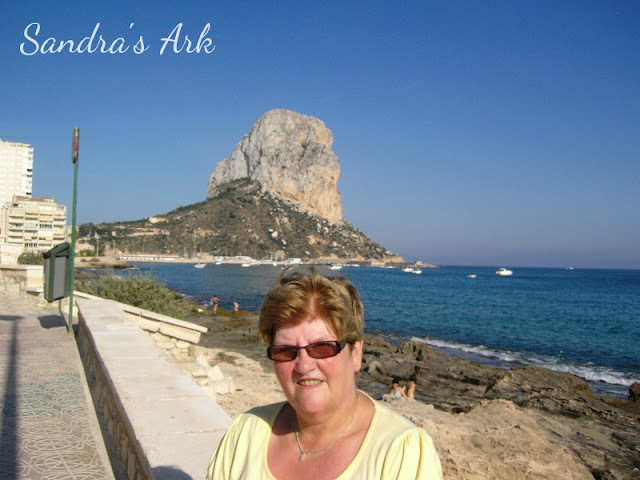 The town of Calpe sits right on the coast and has all the usual restaurants and tourist type shops but it is not overly full of tourists, at least you never feel like it is the way Benidorm would be. 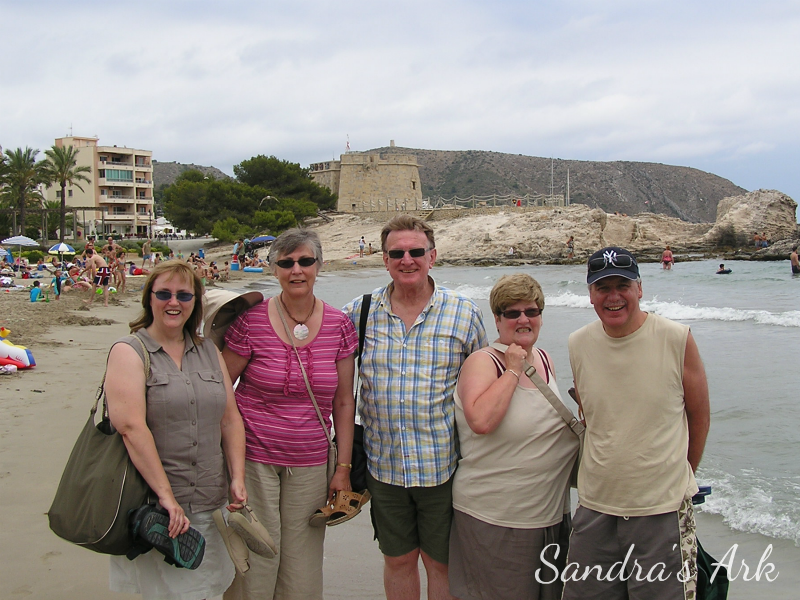 Smaller seaside town with good sandy beaches and a very relaxing feel about it. 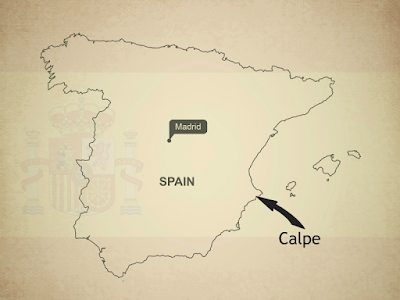 When I was planning this trip I had mentioned to our oldest son that we were going back to Calpe again. Later he was talking with some friends of his and ours and they mentioned they were going to have a trip to Spain but then imagine his surprise when they said they were going to a place called Calpe. He quickly told them we were also going there and then discovered that our holidays would overlap by three days. So it was arranged that we would meet them the day after we arrived which would be the day before they left and we would have coffee on a beach north of Calpe. Me, our friends from Wales and my sister & brother-in-law. Not only did we find that nice beach and have a great time together chatting and drinking coffee and then having lunch but when they realised that my brother-in-law loved to eat at carveries they told us about the best one they had ever been to which was only 10 mins from that beach. Well you can guess what happened - yes we met up again a few hours later at the restaurant and spent a lovely evening together as well. 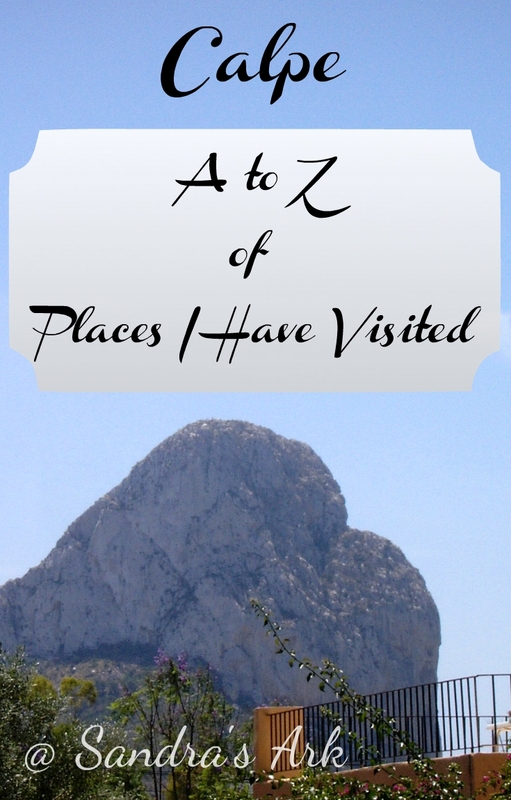 While we were there we went round Calpe and also some of the small places nearby. 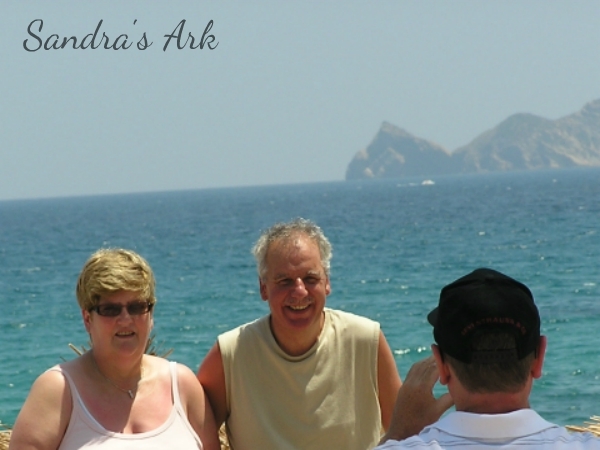 Here is a picture I took of Fred taking a picture of Averil & Victor on one of the lovely coastal walks we found. 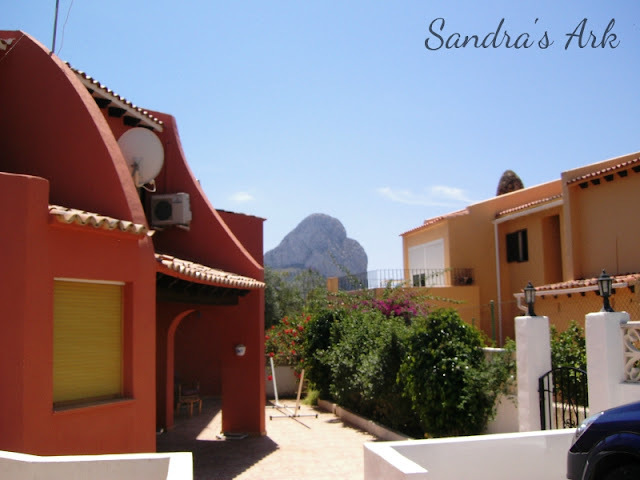 North and South of Calpe you will find many beaches and other little towns to walk around and of course stop for a coffee or cold drink. 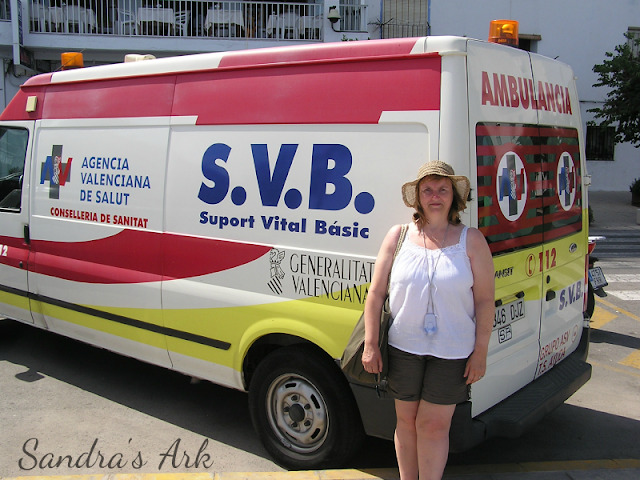 Of course everywhere we go we always find something to laugh about and this time it was a medical van with my initials on it so of course a photo just had to be taken. 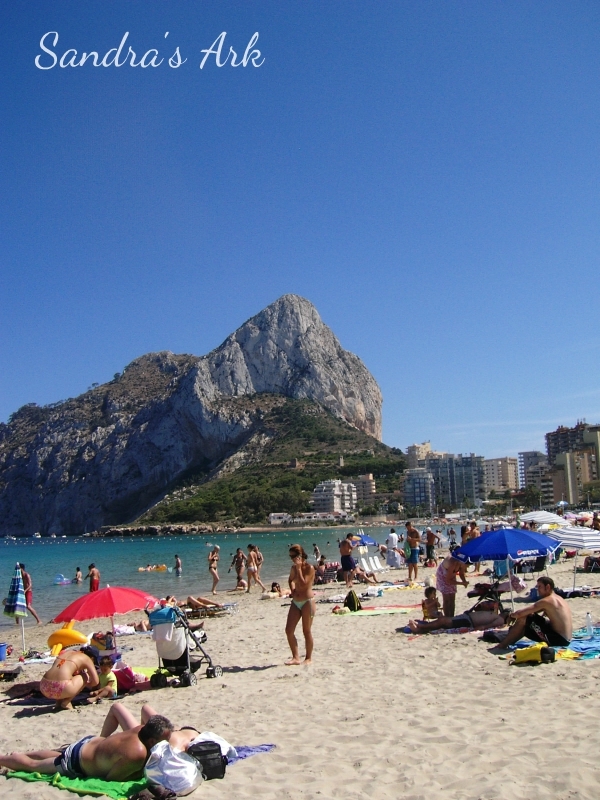 There are 2 main beaches in Calpe and they are very easy to get to from the town because the town is basically built beside them. There is also a very large well-known rock at Calpe which juts out into the sea and the two beaches have formed on either side of that rock. Victor got a good picture of it here. The water was great for bathing there and we had fun - Fred and Victor and I are like kids when we get in the sea together. The beach on the left was longer and had more shops along it which was good because the day we went there was the hottest day and we needed to buy a parasol to use on the beach or we could not have stayed for as long as we did. Amazingly we had a view of the rock from our appartment as well. A suppose the rock is so famous there because it is so large and hence very noticable for quite a few miles along the coastal road. Have you ever been to Calpe? Check this out to see if it is worth visiting. 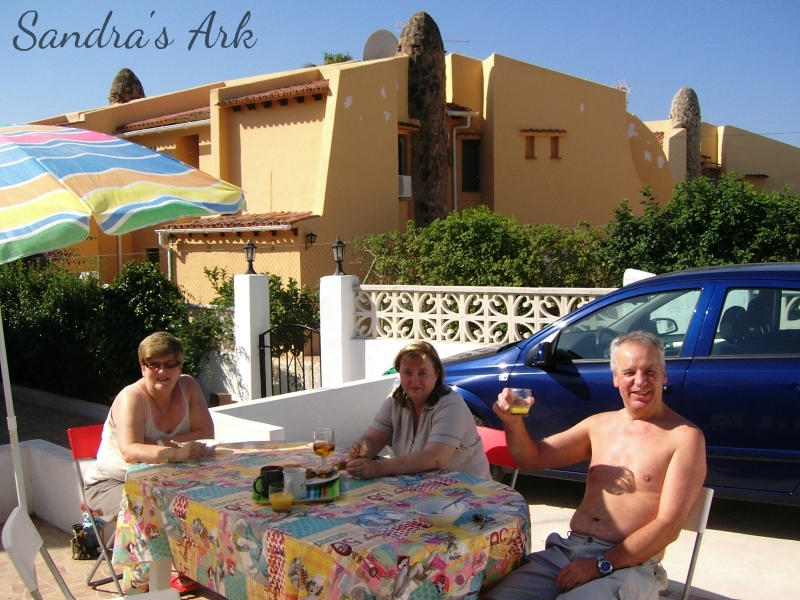 meaning that we had breakfast outside each morning and almost any other meal we had when not off exploring. There was also a very nice pool a couple of mins walk from the appartment to go for a swim before dinner in the evenings. The flora is very colourful in that area and around our appartment there was this lovely dark pink display of flowers which made a nice background for a picture before going out for a meal one evening. What a fun idea! Loved the photos. It's like nowhere I've ever been. 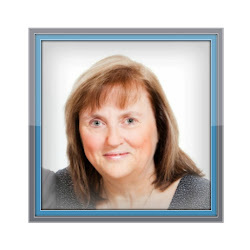 What an interesting blog. I love to travel myself. I'll have to check out more of your posts. 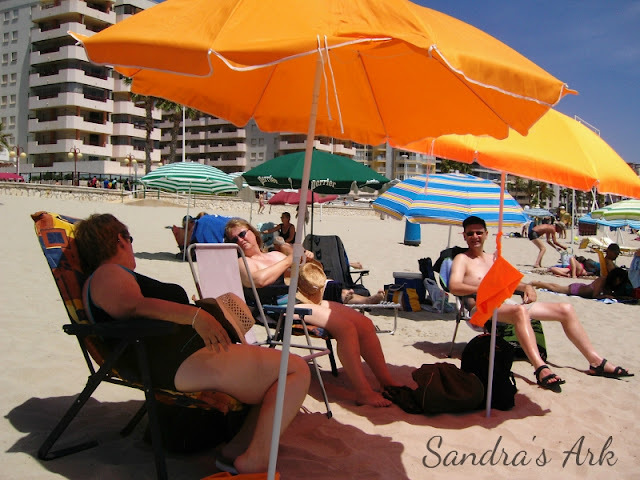 Dear Sandra, what an idyllic vacation spot! No wonder you headed there 3 times. Thanks and blessings for sharing its highlights. Amazing spot! I love Spain, but i've never even heard of that town; I love finding places like that that are hidden gems. Looks like a beautiful little place to visit!